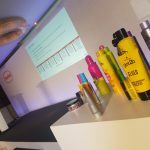 Henkel Consumer Division Conference 2019 - Evans Audio Visual Staging Ltd.
Henkel brought their Consumer Division Conference back to Chewton Glen Hotel & Spa for 2019. 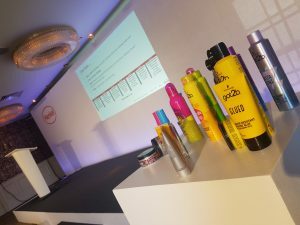 Continuing their work with Image Intelligence, Evans provided a white set with printed Foamex signage, a matching white lectern and display plinth. The stars of the show were two recent additions to Evans rental stock; a Panasonic 10k single chip Laser Projector with an ultra short throw DLE035 mirrored lens. The new equipment allowed Evans to rear project with the set less than 2 metres from the wall!